While it may not seem like it with today’s temps, fall is just about here. 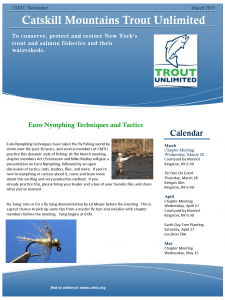 The Catskill Mountains chapter of Trout Unlimited is going to kick off the season by going fishing this Friday, the 7th. We’re going to meet at 5:45 at the parking lot of the Phonecia Diner, with plans to hit the stream by 6:00. We’ll fish until 8:00, and then meet at Brio’s Pizza afterwards. As you know, the temps are supposed to be high this week. So keep an eye on the weather. We’re expecting cooler temperatures by Friday. We’ll check the stream temps on Friday morning and see how cool the water got. If the temperatures are still high, we’ll go fishing next Friday. Also, remember to put September 19th on your calendar. That’s the date of our first meeting of the fall. Morgan Lyle, author of Simple Flies will be our speaker. He’s currently writing a book on Tenkara.